While Thornton aims to use videogame technology to help preserve native languages, game writer and academic Beth Dillon believes more indigenous involvement in the creation of mainstream games will also help spread native culture, especially among children. Dillon, who is of Anishinaabe, Irish and MÃ©tis descent, works with other technology-minded academics and artists through the Aboriginal Territories in Cyberspace (AbTeC) network, a group dedicated to creating websites, online games and virtual worlds with aboriginal content and authorship. 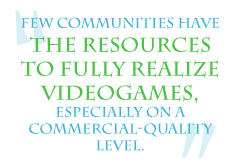 She says videogames remain an untapped field for native communities: "While there are numerous web-oriented projects and multimedia compilations like the curriculum from Wisdom of the Elders that includes content from their radio and other oral history recordings, few [communities] have the resources - individuals with skills and finances - to fully realize videogames, especially on a commercial-quality level." One of AbTeC's programs shows native children how to make games by teaching them modding and storytelling skills with assistance from both industry professionals and native elders. Called the Skins project and based at Montreal's Concordia University, its participants learn 3-D art techniques and programming skills. Native elders share their wisdom at the same time, allowing the kids to uniquely blend modern technology and knowledge from the past. "Traditional knowledge is vital to the well-being of our youth and their futures," Dillon explains. "We learn from the ones before us. In the case of Skins, the importance is carefully considering traditional storytelling practices and how to transform that experience into a digital form for sharing with players or users." Dillon sees similarities between gaming and the native art of oral storytelling: "A storyteller and the listeners create the experience together, much like in videogames - the game designer sets up the environment and rules, but the player's interactions really create the narrative. Both experiences rely on a participant's sense of presence, immersion and emotion to be successful." Since September, a Quebec high school run by local Mohawks has been the site of the first Skins program. Participants started making creations in Second Life and plan to mod in the Unreal engine soon. Dillon says education is the key to getting more natives involved in the game industry, in which only 40 of 6,437 workers identify themselves as "Native American" (including seven Canadians and one Brazilian) according to a 2005 International Game Developers Association demographics report. "As with any barrier, our efforts start with youth," Dillon says. "The more who feel empowered to go after that game-related job they want, the more presence we'll have. For other generations, there needs to be a lot more education in the whole game development process ... it's not just about having aboriginal involvement, but quality involvement."